Everything you need to prepare for the CompTIA A+ exams CompTIA A+ is the most sought-after certification for PC technicians. This guide covers every aspect of the required exams 220-801 and 220-802. Fully updated to cover the latest best practices, current software and hardware, and mobile OSes, this Deluxe guide also includes an exclusive bonus CD featuring additional practice exams, flashcards, instructional videos, and the entire e-book in ePDF, eMobi, and ePub versions. 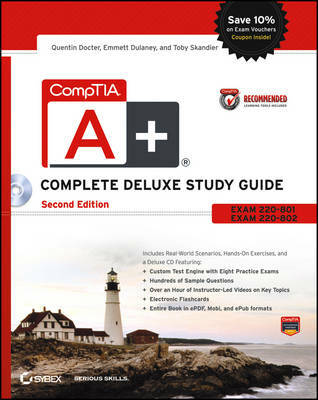 * Includes a coupon for 10% Off CompTIA Certification Exams * Fully updated to cover the latest exams and exam objectives * Covers personal computer components, laptops and portable devices, operating systems, printers and scanners, networks, security, safety and environmental issues, communication, and professionalism * Bonus CD features the Sybex Test Engine with additional practice exams, twice the electronic flashcards as the Standard edition, and eMobi, ePub, and ePDF versions of the book CompTIA A+ Complete Deluxe Study Guide, 2nd Edition is a complete test-prep guide that will help you pass the A+ exam with confidence.